I have been thinking a lot recently about sleep! I guess it has a lot to do with being in the uncomfortable stage of pregnancy now, and also the fact that since the clocks went forward the kids are rarely asleep before 8.30pm (some nights 9.30pm). I am also trying to figure out bedroom arrangements with the impending arrival of our new baby and how it will all affect Megs as she starts full time school and Ethan as he goes back. I want to create calming sleep spaces for them and then get them all into good routines, or at least a lot better than what we have right now, but its all rather stressful at times! 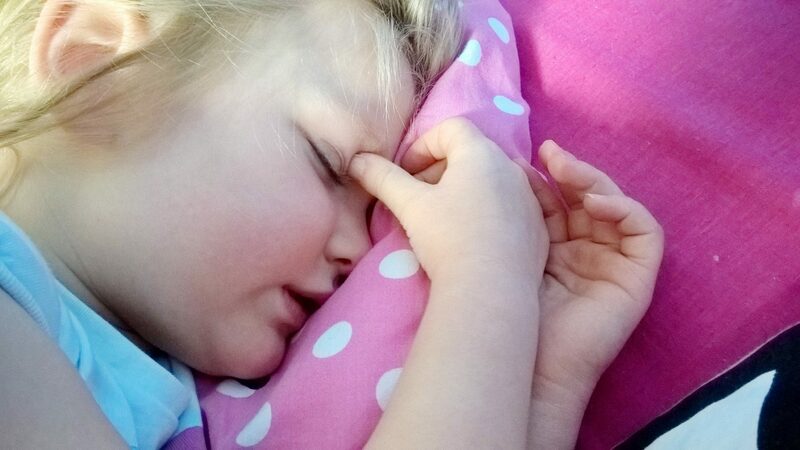 Whilst weekends and school holidays don’t matter so much, I worry of how they might be at school when they blatantly aren’t getting enough sleep and seem rather cranky by mid afternoon. I read recently that children need between 10-12 hours of sleep every night for optimal learning and development and that lack of sleep can affect learning and memory ability, all of which is closely linked to academic performance. Obesity, a reduced immune system, bad moods and behaviour and even depression have also been linked to sleep deprivation in children… Its all a bit worrying and goes beyond my repeated “you need to rest your bodies to have a good day tomorrow” spiel. I have certainly experienced the bad moods after repeated late nights of messing about, and behaviour can be questionable too when tired. Megan especially gets rather emotional, but the learning links have really made me think and so I have been trying to figure out what it is we need to ensure they are getting the recommended 10 – 12hrs a night as we prepare for several room and sleep disruptive changes over the next few months. When I think of a good nights sleep for myself, I always think of a snuggly bed, comfy pillows, not too hot or cold and generally one that looks inviting. 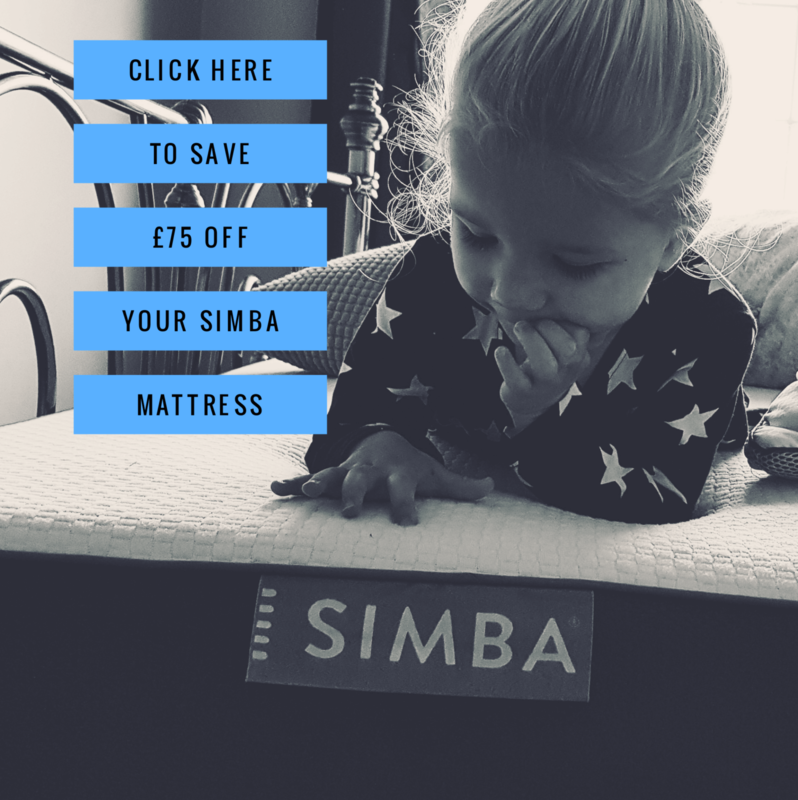 You probably already know that babies and young children hate the restriction of heavy bed clothes and will kick them off during the night? 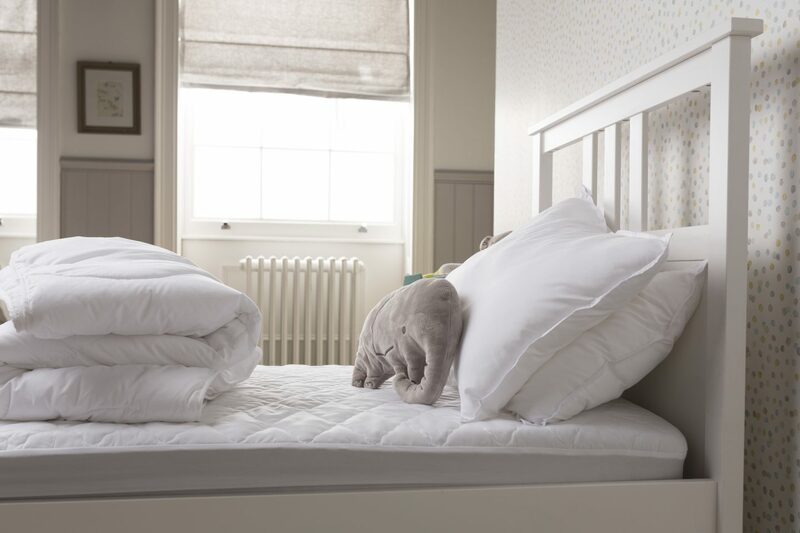 but not just this, my kids will also often use the excuse of “feeling sweaty” as a reason to not stay in bed and it didn’t click until recently that perhaps a more lightweight and soft duvet/pillow is the answer? They then would be able to control their body temperature more easily and this would help them rest better. British company “The Fine Bedding Company” now have a Junior range – “The Junior Fine Bedding Company” which features a number of top quality bedding essentials, all machine washable (great for general cleanliness and sicky nights) and include a light as air Washable Duvet and Washable Pillow which is available in cot, cot bed and single bed sizes (one for all the kids then!). They look really lovely and too are very affordable. They are certainly something that seems to tick all of the boxes both now and in then next year when baby is moving into her toddler bed too (whhhhaaatttt shes not even born yet)! I’ve never really been one to be so into bedding specs, but since we got a new duvet at Christmas, and with this lack of sleep malarkey, I can’t help but think something like this is what we need….luxury and high end, which means lasting and therefore a useful purchase for family life, and I love that its made in a way that helps control body temp and is machine washable! Perfect! Also whilst its something we personally don’t need right now, it may be useful to mention they also have protector pads for “accidents” and some lovely wool products too. I like my room to be nice and dark when going to bed, yet our kids rooms are at the top of the house with large velux windows and therefore very light and also very annoying in the summer months to get them to sleep. Nathan’s sister kindly made us some black out blinds for them, and yet some nights, in my rushing to get them down, I fail to put them up. Apparently though from my sleep reading, black out blinds help to produce the sleep hormone “melatonin” (interesting), not to mention the obvious that if its dark they can relax and get the message that night time = bed time. Oh the amount of times I have heard the excuse “its not bed time its still light”, it drives me mad in trying to teach them its about the time not the level of light or dark, but this is usually to no avail. A black out blind and dark room scientifically and practically ensures they fall asleep quickly, something Megs especially needs to get into the habit of with a soon increasing schedule at full time school! Right….where is that black out blind! My kids love to watch a movie before bed and then have a bath and this has created for them 2 chilled out activities they can do to be calm leading up to the bedtime routine. We don’t do baths every night as I feel that is unnecessary, but they will after we have had dinner and tidied up either play for a while with toys or watch a movie with blankets to wind down. We did occasionally let them play on the Ipad during this hour or so, but found this to be rather annoying when they had a melt down every time it was time to come off, and it seemed that it was probably getting their brains more active than relaxed! A movie or programme seems sufficient right now. 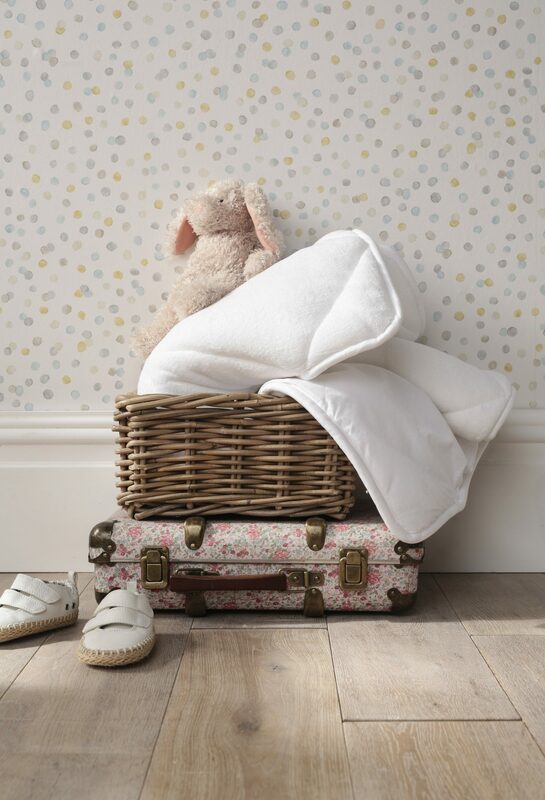 On the nights when they do have a bath, I use a lavender bubble bath, rarely talk to keep it quiet and then put lavender lotion on before they get into their PJs – on these occasions bedtime seems to go a little more smoothly and they love it! 7.00pm – Quiet chats about the next day plans (5mins max) and then kisses and hopefully GO TO SLEEP (Usually with a teddy) – We sometimes put on a story CD or classical music to help them stay in bed and relax! Its quite simple, but works well and helps them relax. The issues arise when they are late going to bed, they want to play, we skip something out in desperation to get them to bed sooner or they just say “we’re not tired” (I think this part is also influenced a lot by points 1 & 2)!!! We have learnt, on too many occasions that letting them drink before bed leads to disrupted sleep, sleepy accidents on the bathroom floor in the middle of the night and delirious whines to get to the loo in time! As they are both toilet trained at night, on the odd occasion this happens it makes me mad with myself that I gave in and thus have ended up rushing around late at night cleaning and trying to get them back to sleep – in my opinion its easier just to limit it and say “sorry no drinks before bed”! Our plan is to sort out bunk beds in a shared room, with snuggly places to sleep, re attaching the black out blind and working to the routine. Wish us luck, many peaceful evenings and well rested kiddos! 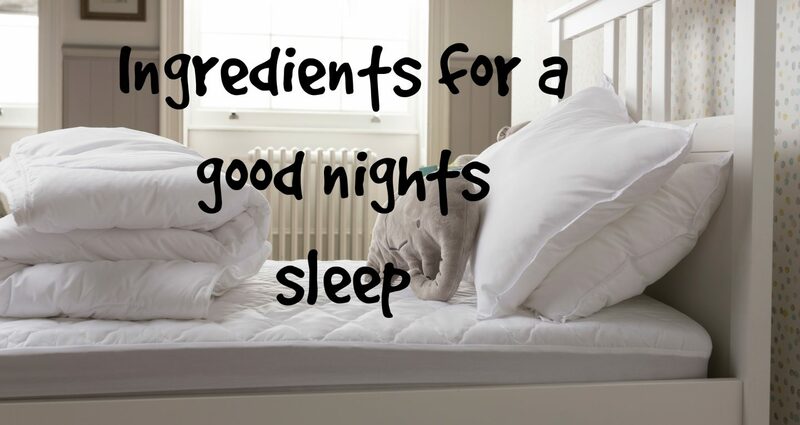 This post is in collaboration with “The Fine Bedding Company” – lovers of great sleep! I have struggled with insomnia for couple months. It takes me a while to get to sleep and I wake up lots. I actually saw a nutritionist who thought it could actually be hunger stopping me sleeping through. At her suggestion, I now have a glass of milk/yoghurt/small banana/couple of ryvita just before bed and I also cut out the afternoon caffeine. It worked out pretty well for me. The name of the article itself attracted me a lot towards this article plus it was accompanied with wonderful pieces of advises. I really loved reading it.